A Sacred High Place shares the history of a small West Tennessee cemetery and adjoining house of worship near the village of Finger in northeast McNairy County, Tennessee. Author and local historian John E. Talbott believes its history is rich because of many of the characters buried in it. These people may not have been financially wealthy, but they were among the leaders of their times. Buried at Mount Carmel are public office holders and politicians, soldiers of various wars (especially the American Civil War), farmers, merchants, entrepreneurs, educators, a physician, a hobo, the first white child born in McNairy County, and scores of others of varying occupations. On the third Sunday in May, family members of those buried here return to decorate the graves of their ancestors and fellowship with one another. 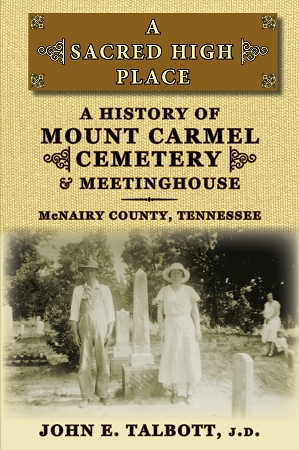 A Sacred High Place includes histories of the cemetery and church, biographical sketches and photographs of many interesting McNairy County citizens buried there, and transcriptions of the tombstones there.